Who’s the hottie with the great body? Why that’s Nick Jonas of the Jonas Brothers! But there is a catch as to how he is able to maintain that nice physique of his. When Nick was just 13-years-old, he was diagnosed with Type 1 diabetes. Since being diagnosed, he had to make a huge cut back on his sugar as well as staying away from soda. Nick also told Good Housekeeping mag in 2011 that he eats a lot of eggs since its good for him, and gets into the gym as much as possible. We credit you Nick for staying strong and keeping up that great bod despite your disease. True soldier! We have all seen the Mrs. Carter risky concert costumes (the one drawing attention to her ta-ta’s), and now she is at it again flaunting her amazing curves and getting our attention on the cover of Flaunt Magazine. 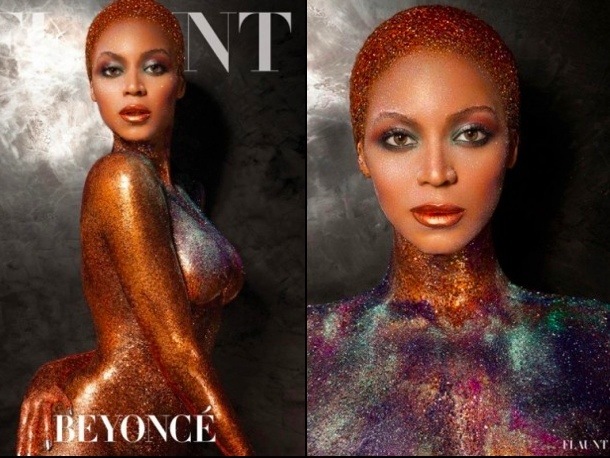 Looking fierce and comfortable in her skin Beyonce is seen in colored body paint striking a pose for the magazine’s photoshoot. Flaunt: Some were critical at your participating in a Pepsi campaign after you moved your body for childhood obesity. Where is the balance between your career objectives and your philanthropy? We are definitely seeing balance working for you and your body Bey! Lady Gaga recently took to social media to admit a personal struggle with her body that she has dealt with since she was a teenager. She encouraged her Little Monster members to post pictures of themselves to overcome insecurities with their bodies. We can admit that Lady Gaga looks amazing, and credit her for being a role model to other people struggling with weight issues.